The entire line of Sealmaster Magnetas shown with optional foot-pedal stands, foot-pedals, poly-locks and rollers. The 621-MG Sealmaster Magneta shown mounted on optional foot-pedal stand with poly-lock holding layflat tubing in place. MAGNETIC LOCKDOWN! The Sealmaster Magneta is the latest model in the range of sealing machines from Audion Elektro and Packaging Aids Corp. It features featherlight operation. The upper jaw can be closed by the slightest pressure of one finger or by an optional footpedal; then a powerful electromagnet holds the jaws closed while the bag is sealed. The sealing and cooling time is automatically cycled before the upper arm rises to release the sealed bag. The sliding knife for trim seal is standard. Standard versions come in five sizes and Stainless Steel versions come in two sizes. NEW!! Electric Models. They are operated by the easy action of an electric foot switch. No manual operation, eliminates operator fatigue. NEW!! Twin Seal Models. 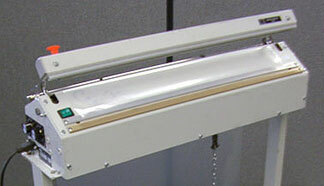 Features two side-by-side sealbars to make two parallel "twin" seal lines on your bag or tubing. Very easy to maintain--the sealbar pops in and out in less than a minute and you are back in production. The new body style of the Sealmaster Magneta opens in the front or back, giving easy access to the inside of the unit. Finally, the new head style is much easier to adjust with externally mounted adjustment bolts. 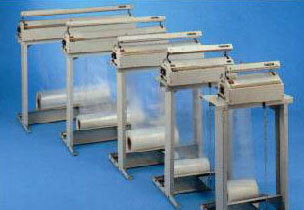 Rolloflux RL600- a free standing set of rollers for holding & feeding layflat tubing.